Motherhood is a fast-track opportunity to gain self-knowledge. What does self-knowledge mean? What is inner work and how do we DO it? How does one actually self-transform? Motherhood is like the most intense, long haul retreat you could ever go on; you meet your best and your worst behaviours, and no matter what you have to show up every day and be “Mum”, even when you don’t feel up to it. And yet, it’s especially when we don’t feel up to it that we have an opportunity to find a new way forward. If we choose to approach motherhood as path then the truly confronting, life-changing, deeply human work of mothering becomes a fast-track opportunity to gain insight into our habits and choices, and cultivate some new behaviours more aligned with our aspirations. Motherhood has pushed me to the edges of my love, anger, tolerance, exhaustion, and self-doubt, time and time again – it has called up my most base emotional reactivity, dredged up old family systems, and forced me through the mincer of my own worst behaviour. Whether my kids are 3 and 6, 9 and 12, or now 13 and 17, I’m a person-in-progress, learning, especially when I’m a mother-meeting-challenging-moments! Motherhood has given me daily opportunities to grow my capacity for patience, to find new ways to love and be alongside someone at their most vulnerable, even when that someone is me. I have had countless opportunities to be more self-responsible, to set clearer boundaries, to slow my heated reactions down. But how do we catch ourselves in the many spilt milk moments? And what do we DO then? Working out what to practice, when and how, and having the wherewithal to find options other than shouting, crying, collapsing inward, zoning out, or missing the moment, is where the inner work of motherhood lies. Over the last 25 years I’ve coached and directed individuals and groups in self-inquiry and reflective learning processes. Using action methods to reflect on specific moments from each person’s own setting, enables insight to emerge from the whole self, as all of our mental, emotional and physical intelligences are engaged. This fits beautifully in a yoga frame as we live and respond in action. By engaging the sensory body, we are able to literally practice and feel the effect of doing something new and differently. This is an experience of embodied transformation; intention integrated into a developing sense of self that is responsive to our living, to the choices in front of us, to our capacity to change. 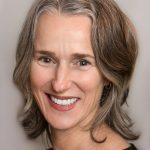 Last year US publishers, Familius, published my book Spilt Milk Yoga – A Guided Self-Inquiry to Finding Your Own Wisdom, Joy, and Purpose Through Motherhood which takes the work of self-inquiry, coupled with contemplative yoga practices, and applies them to the daily journey of motherhood. Spilt Milk Yoga is the practice of growing ourselves through the process of growing our children, coming to know ourselves, understanding why we do what we do, articulating what we want to cultivate, and creating new ways forward for ourselves, so we can live our lives as we want to, as mothers, today. Spilt Milk Yoga is NOT a parenting book, or a book of yoga poses, it is the yoga we do on the inside; developing our inner flexibility, grace, strength, softness, steadiness and balance. By applying self-transforming practices to our experience as mothers we profoundly effect not just our own lives, but the lives of our children. Being a reader of the Yoga Lunchbox, you’ll probably know that the word “yoga” means to yoke. To yoke something is to harness its energy and turn it to good use. By consciously yoking the work we do as mothers to growing our self-knowledge, we align each to enrich the other. I want to turn attention for a moment to that little word OWN in the subtitle; Finding Your OWN Wisdom, Joy, and Purpose through Motherhood. That OWN word matters. In the spilt milk moments of my day, I have to OWN my behaviour in order to work with it. In the face of my OWN experience and circumstance, the most fruitful practices are ones that lead me to my OWN wisdom, joy and purpose, not someone else’s, MINE. In coaching students, parents, professionals, and mothers the most profound revelations, transformations and shifts I’ve witnessed occur when people connect to, articulate, and come to know their OWN truth. From there they are able to orient to their OWN purpose, connect to their OWN wisdom, and wake up to, and effect, their OWN actions and choices. This is embodied transformation, a shift made by the whole self. I’ll give you a beautiful example of a moment of embodied transformation from a recent Spilt Milk Yoga group. Participants were reflecting on a spilt milk moment from their week and what they were wanting to cultivate in response to it. One mother, Anne, said she wanted to follow her intuition in mothering moments when she lost her way. She described a growing sense of unease and anxiety in her gut, especially when she had to make her daughter, Bella, do spelling homework. Her school had expressed some concern that Bella had a learning difficulty, so homework time was fraught with the additional pressure of Anne’s desire for Bella to focus, to practice, to learn, especially as Bella much preferred doing cartwheels in the lounge. I directed Anne laying out the scene she had in mind from her week. Anne is amid dinner preparations, shepherding homework and juggling the busyness of the evening. Suddenly Bella shouts “Done it!” and abandoning her half-finished homework leaps up enthusiastically to show her mum her cartwheel practice. Anne enters the lounge sees the half-finished, misspelt, homework, gives up, and with the feeling in her gut intensifying, turns to the kitchen to pick up her phone as a distraction. This is the critical moment Anne has identified in which she wants to connect to her intuition. Have you ever heard someone say they followed their gut instinct? I interviewed Anne to find out more about her gut feeling, coaching her into the role of her gut where she could give voice and form to this powerful force in her life. Back in role as herself, watching and hearing her daughter’s words, Anne saw something that changed her world. Bella did have stickability, she did have focus, she was practicing over and over, she was learning a skill. Bella was practicing learning. With this realisation Anne was flooded with relief and joy, and celebrated Bella’s stickability, and her own learning, with a few cartwheels of her own. Anne finished the session with a strengthened connection to her intuition, with renewed trust in herself, and her daughter’s ability to learn. She could see that Bella was good at learning and practicing, and that she as a mother could be more purposeful in supporting this expression of her daughter’s ability to focus, practice, and learn. Needless to say, the other mothers present were all affected by Anne’s work, and the learning and wisdom were shared and appreciated by all. Weeks later Anne told me she felt the significance of that moment across generations. Listening to herself and really seeing her daughter had shifted her relationship with her mother and her grandmother. She told me that although it was a change just between her and Bella, she felt as if she was changing the world. Mothers are world changers. This is the work I am interested in. This is the work I am committed to. By meeting motherhood consciously as path we engage with a mighty force for self-transformation that has the power to affect us all; our children, our families, our communities and our world, across generations. So back to you, mothers, friends of mothers, partners of mothers, children of mothers. To all the mothers working your butts off and hearts out being the best mothers you can be, and wondering how not to go crazy in the lag between personal and social enlightenment – you are the mothers I wrote Spilt Milk Yoga for, and this work is dedicated to you. “Spilt Milk Yoga – Connecting Mothers to Self and Others” Weekend Workshop: Saturday, July 1st 1-4pm & Sunday, July 2nd 9am-12pm. Find out more & register on Eventbrite. You can follow Spilt Milk Yoga on Facebook and Instagram. Spilt Milk Yoga – A Guided Self-Inquiry to Finding Your Own Wisdom, Joy, and Purpose Through Motherhood is sold at all good bookstores, and available at Amazon. Cathryn Monro is a professional artist, writer, educator, facilitator and mother of two teenagers and has 30 years’ experience and training in inquiry-learning and group processes.